CHEVY SBC 283 327 350 400 HOT ROD EXTREME FUEL PETROL PUMP!!! Home » CHEVY SBC 283 327 350 400 HOT ROD EXTREME FUEL PETROL PUMP!!! Extreme Series Fuel pump for most small block Chevy engines. This pump has a 140 gallon volume at 6 psi. At wide open throttle this pump may run a max pressure of 8psi. This is the fuel pump you want for high Horse Power Street or strip applications from 200-450 hp. The fuel demands under wide open throttle on an engine are high, especially those with large cfm carbs. Never would you want to run a stock fuel pump on an engine that has been built up to any degree above standard. Remember most stock Chevy engines produce around 180-210 hp. 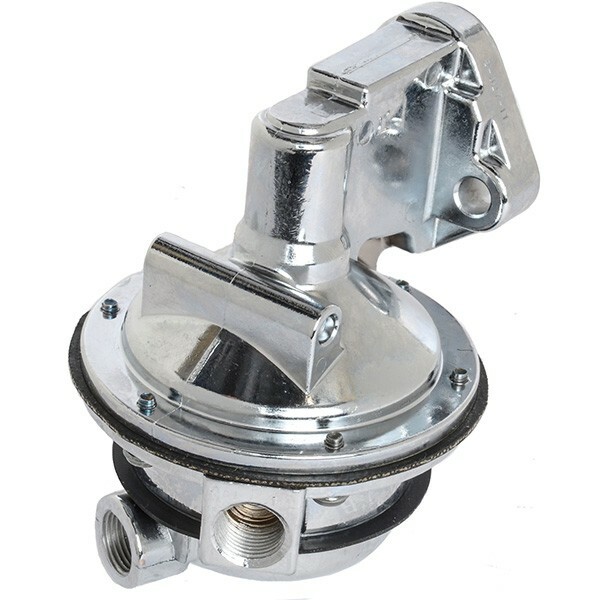 The oem style fuel pumps were designed to accommodate a very low fuel demand. Fuel pressure should be regulated to between 5 and 6 psi for normal driving. Off-roading might require less pressure, while all out drag racing might require 6-8 psi. Too much fuel pressure can cause the carburetor to run rich at low speeds, while too little fuel pressure might cause the carb to run lean during high engine speeds and loads. It is recommended that you run a fuel pressure regulator and gauge to set the pressure where it needs to be. The regulator will keep the pressure consistent and eliminate problems caused by too much or too little pressure.